Why Did My Soap Crack? 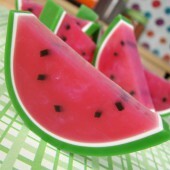 You poured your soap into the mold and everything looks wonderful. But, when you look at the soap the next day…ack! There’s a huge crack down the center. What happened? There are several reasons why your batch may have cracked. Below are some of the most common cracking culprits, and how to avoid them. One reason why a batch of soap might crack is because of the recipe. 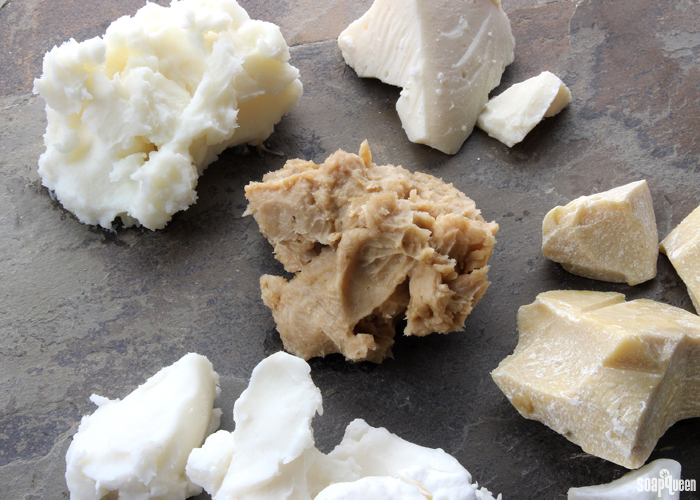 Soap is more likely to crack if it contains a large amount of solid oils, butters or wax. 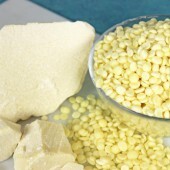 The potential for cracking is greater with more brittle butters and waxes, such as cocoa butter and beeswax. 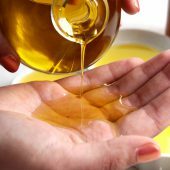 In general, I recommend limiting the amount of butters to 15% of your total oils, and the amount of beeswax to 8% or less of the total oils. 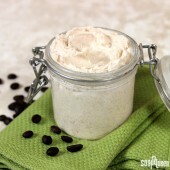 This post has more information about various butters and how to use them in your soap and other beauty products. 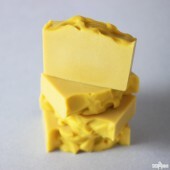 Lots of firm butters like cocoa butter can cause soap to crack. I recommend using no more than 15% butter in your recipe to prevent this. 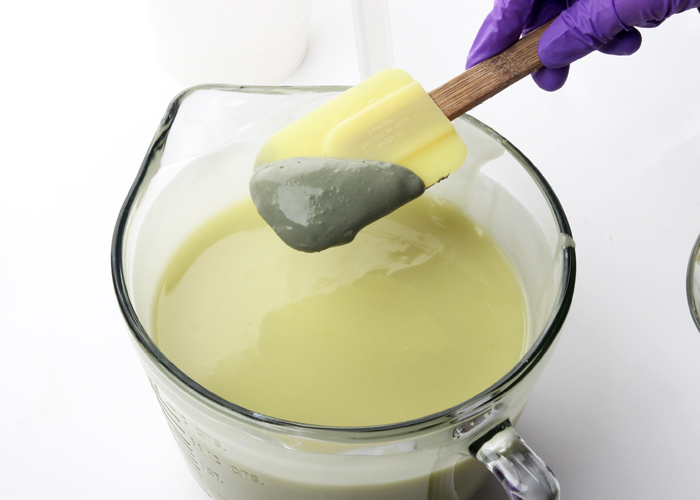 To make cold process soap, lye and oils are combined to begin the saponification process. 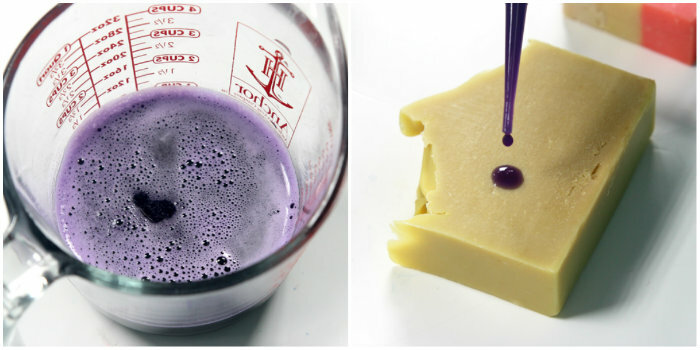 In a balanced bar, there is no lye leftover in the final product – it all gets transformed into soap! If too much lye is added, this can lead to a “lye heavy” bar. Lye heavy batches of soap tend to be dry and can crack. 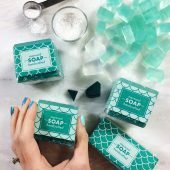 Think your soap might be lye heavy? 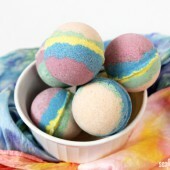 Click here for information on how to test the pH and how to use it to make laundry soap. Lye heavy soap can be brittle and may crack. 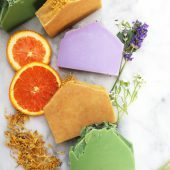 Learn how to test the pH of your soap here. If soap gets too hot, it may crack. 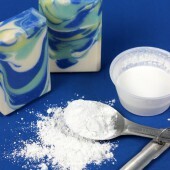 The average soaping temperature is around 110-130° F. Once the soap is poured into the mold, it may go through gel phase. 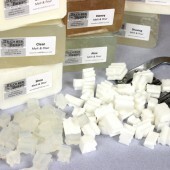 ‘Gelling’ and ‘gel phasing’ in cold process soap refers to a part of the saponification (soapmaking) process where the soap gets warm and gelatinous in the mold. During gel phase, the soap can reach temperatures up to 180° F. Click here to learn more about gel phase. 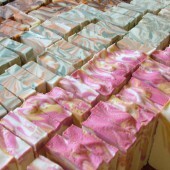 The soap becomes hottest in the center and tends to cool down toward the outside. As the heat makes its way out of the soap, it causes the soap to expand slightly. This can cause a crack on the outside. 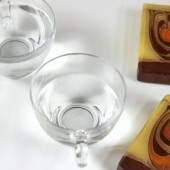 Temperature is perhaps the most common reason why a soap cracks. 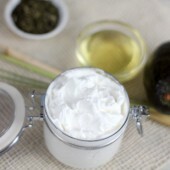 It’s even more likely to happen if the soap contains a high percentage of butters, waxes or dry ingredients. 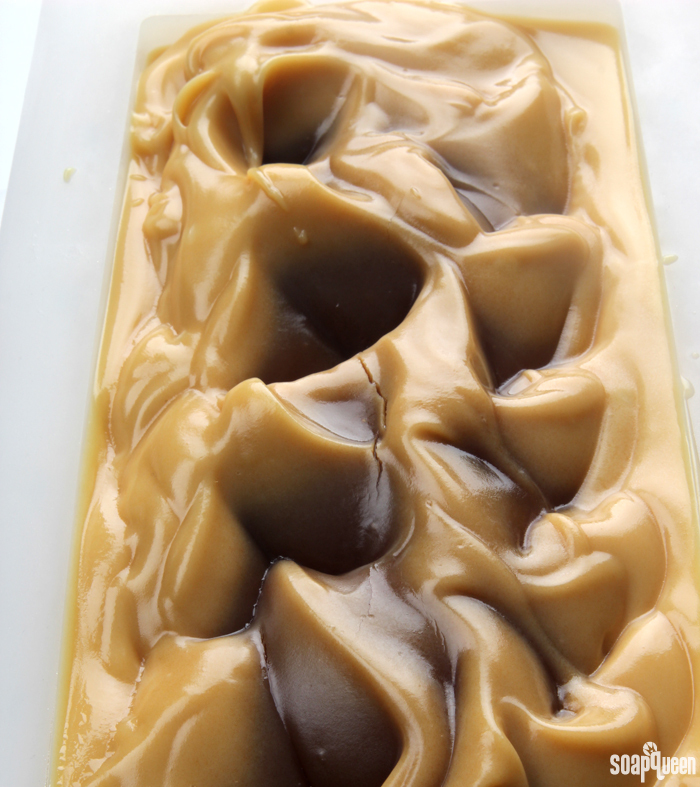 Adding honey to cold process soap can cause an extreme gel phase, which can lead to the soap cracking. 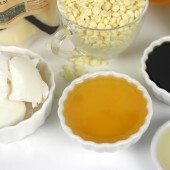 Adding ingredients to soap that contain sugar, such as purees, honey or milk, promote gel phase. 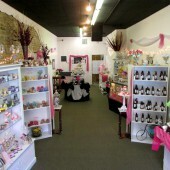 In the photo above, honey was added to the soap at trace. The honey caused the soap to go through gel phase and crack in the center. 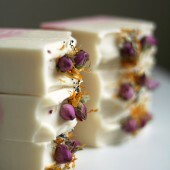 Learn more about adding honey to your cold process soap here. 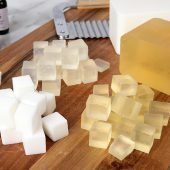 If you add ingredients with extra sugar such as honey, place the soap in the fridge or freezer directly after pouring for 5-24 hours to help prevent gel phase and cracking. 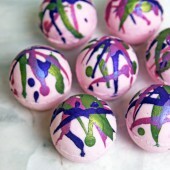 Soap can also crack if it contains ingredients that absorb moisture, such as clay. 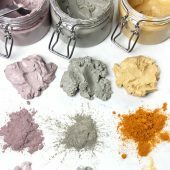 To compensate for the moisture clays absorb, I recommend dispersing them in distilled water. I usually use a dispersion rate of 1 tsp. 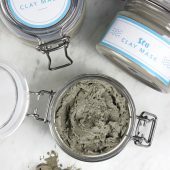 clay to 1 Tbs. distilled water. 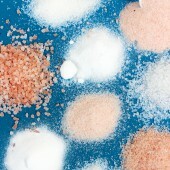 While clays are the most common culprit for cracking, adding too much of any dry ingredients can contribute to cracks. 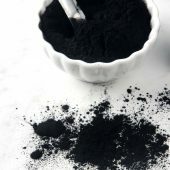 For example, if you were to add lots of colloidal oatmeal, activated charcoal or arrowroot powder without additional water or oil, it may cause the soap to become dry and brittle. 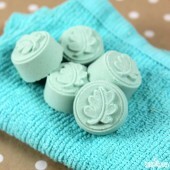 To prevent clays from drying out your soap, disperse them in distilled water. 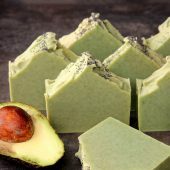 Above, dispersed French green clay is added to soap batter in the Avocado + Spearmint Cold Process Tutorial. I just made a batch of soap with honey and oatmeal in it. I noticed early on that I had some dark brown seepage on the top. Now that I am almost 24 hour out and have cut it, I still have some seepage. I’m assuming it is harmless but annoying. I’m hoping it will soon dry. Any ideas? I’m assuming I didn’t get the honey mixed well enough. 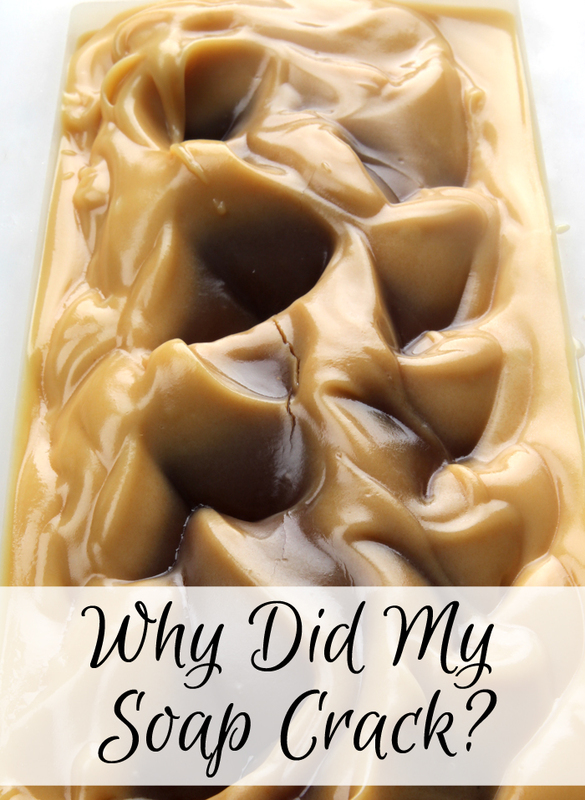 How did you store your soap once it was in the mold? I’m asking because I think it may be temperature related. If the soap gets hot it can get the liquid on the top like you’re describing. If that’s the case, it will go away in a few days. Hi! I just completed my second batch of cold process soap ever yesterday. Today it has a huge, deep crack through the top. From this article, I can guess why. 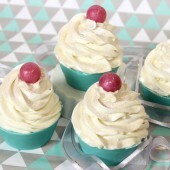 I used two recipes, one for the base soap and another for the soap frosting on top. 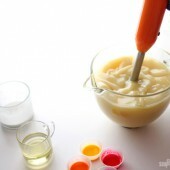 The soap frosting recipe contains mostly hard oils. However, it was my understanding that this is necessary for soap frosting to make firm peaks. I worked at room temperature and did not insulate the soap. Is there something I can do to help prevent cracks in this case? One more question: do you think it would be possible to use melt and pour to help fill and camouflage the crack? That is correct, the hard oils in the soap frosting help it hold its shape. I’m not sure why your recipe cracked. What oils did you use? Also, did the soap get warm at all at room temperature? As for the cracks now, you can definitely try using melt and pour. We haven’t tried that so I’m not sure if it will work. 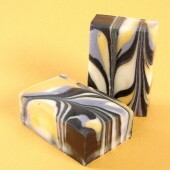 You may also try making a small batch of cold process soap to help disguise the cracks. I used equal amounts of palm oil and coconut oil, and a smaller amount of olive oil. It did heat up quite a bit after it was in the mold, most likely due to the fragrance oil, which was a pumpkin spice. I’ve read spicy and floral fragrances can have that effect. 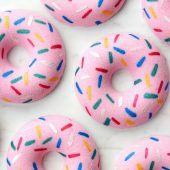 Could leaving the fragrance oil out of the frosting next time help? I think instead of leaving the fragrance out, try popping the soap in the fridge for 5-24 hours when you’re finished. That will help keep it cool and prevent that cracking. It also helps the frosting hold its shape. I’ll definitely try that next time. Thank you so much for your time and advice! Can soap crack because its too cold? Lately I’ve been making soap with cooled lye/oils at around 68F. The oils are cloudy, but I’ve found that the oil and lye still combines just fine. sorry forgot to say that my last batch with this method developed a few tiny cracks on top. I’m using a 33% lye concentration and added sodium lactate and did a light spray of 70% isopropyl alcohol. No beeswax, milk or sugars, but I do have 37% lard and 20% coconut oil in my recipe. I use a wood mold but do not use a lid or other insulation. I read on another comment you say that soaping cold does not cause cracks. I used this exact recipe twice before this week with no cracking, and the only difference is that I forgot to add sodium lactate and also the fragrances/colors were different. I need to add sodium lactate though because otherwise the soap is quite sticky after 24 hrs. Is there anything I can do to prevent this cracking? If i added an lid would that make a difference? On another note, I used to soap at 110 degrees and the mold would feel hot to the touch during saponification. It doesn’t feel hot anymore now that I’m working at 68 degrees. Does that mean gel phase is not happening? Because these are new colors/fragrances I’ve not used before I can’t really tell if its gelled or not. 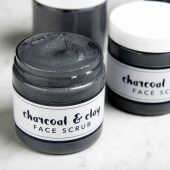 Does the soap have an ashy appearance and a slightly powdery feeling? It may be soda ash that’s causing the cracking. How are you storing your soap? If the temperatures are lower and it’s not insulated, it’s likely not going through gel phase. yes there is a little ash on top but not much. Is there a way to prevent it? I’m storing it in the same room as I make it, at 68 degrees. It is insulated by the wood mold, so I thought there would at least be some partial gel but i see no evidence of that. I used to always put a lid and towel on top but then I got a cracked soap one day (after soaping at 110F) when using a vanilla fragrance oil, so I stopped doing it. But it seems I have cracking whatever I do! sorry i mean is there a way to prevent the cracks due to the ash. If it’s cracking at both cool and warm temperatures, I’m wondering if it may be the recipe. 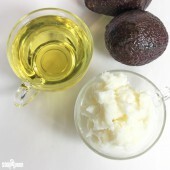 What other oils are you using besides the lard and coconut oil? Hi. 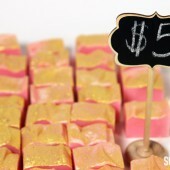 My soap turned out fine in the first batch, though It crumbled while using. However, in my second batch, I tried doing hardness test and dropped the soap on a cemented floor and it breaks whereas another commercial soap didn’t, please what do I do? 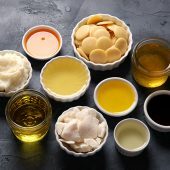 What oils are you using in your recipe? 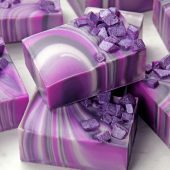 You can add more hard oils like coconut and palm to make the soap harder. Also, what superfat are you using? 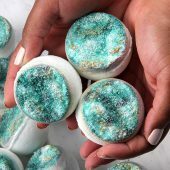 If your soap cracked, you can leave it at room temperature with no blanket or heating pad, or you can pop it in the fridge or freezer for 5-24 hours. That will help prevent that cracking. Usually, cracking is due to the factors mentioned above and not whether the oil is refined. How much coconut oil did you use in your batch? What temperatures were your lye and oils and how did you store it? 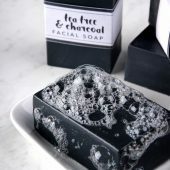 The temperature was around 110 F. I poured the soap in a rectangle silicone mold that sits in a wood box and I put it in my pantry. I have used this recipe before and it turned out just fine. A couple of ideas to try are to lower your temperatures – it could be cracking from the heat. Anther thing to try is to increase your superfat %. 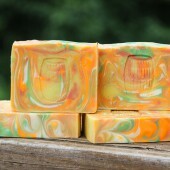 In our test with pure coconut oil soap we had issues that were solved when we used a superfat of 10%. Hope one these ideas helps! What fragrance did you add? I’m thinking the fragrance may be discoloring. Also, how old are your oils? Does it still smell like Playdough? Does that fragrance have any vanilla in it? Did those oils come from a grocery store? Also, what kind of water did you use? Thanks for answering my questions Therese. Hi today I made a 88% coconut oil soap with 6% kokum butter 1% Beeswax and 5% castor oil with 20 percent superfat. I have gone with water discount 2.5:1(lye) and substituted most of the water with coconut milk. The soap traced pretty quick. I soaped at around 127 degrees.Even in the freezer my soap turned darker and it had a crack down the middle. After reading your article I could guess what could have gone wrong. 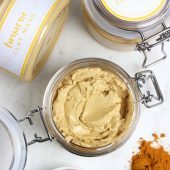 Is it mainly due to the addition of only hard oils and butters in the recipe? Your advise will help me a lot. 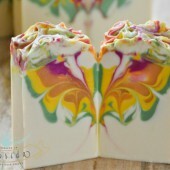 Soap made with 88% coconut oil and beeswax will trace pretty fast. Water discounts can also make it trace quickly. That is normal for soap made with mostly hard oil. Also, coconut oil has natural sugar, which can cause the soap to overheat, especially if you’re working with beeswax, which needs to stay warm. For your next batch, it can help to do a smaller water discount, or skip it entirely. The soap will be hard in just a few hours because of the hard oils. Hey Kelsey. Thanks for the reply. 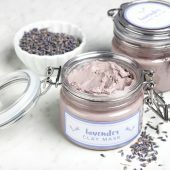 Yesterday I tried the same recipe sans beeswax and the temperature was between 110 and 120 degrees with no water discount. Sadly it cracked again formed partial gel ring in the center with droplets of oil oozing out (I think its my E.O. blend of lavender, rosemary and cedarwood) 🙁 . Should I give the milk part a miss altogether from these kind of recipes ? Did you put the soap in the freezer afterward? I just made my first 100% coconut oil soap using 20% superfat. I took 4 oz of water out of the recipe and added coconut milk in its place. Within 45 minutes of it being in the mold it is almost completely gelled and the top cracked a little bit. It started getting hot as soon as I added the coconut milk and it was thickening so fast I had to plop it in the mold by the end. Any suggestions so this doesn’t happen next time? Should I keep the coconut milk out of it? i have my own manufacturing soap plant.Recently i introduced my new soap in market but the thing that making me hopeless is that after washing hands my soap convert into cracks lots of cracks.tell me the right method of making soap.i used soap noodels, lye ,glycrien ,sodium laurethsulfate (shampo base), water.i made my soap by hot process method.im so disappointed plz help me. I think it may be the lye. 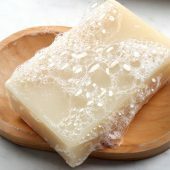 Soap noodles are a finished product, so the added lye may not be turning into soap. Instead, it may be activated and cracking the soap and may hurt your skin. You will want to check with the manufacturer to be sure. 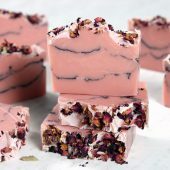 Thnx Dear.And other thing i want to ask my dear is that can u tell me the oils quantity and lye quantity and temp of cold process soap which u make.I try a little bit but my soap trace is so hard so that i can not add colors and other things. 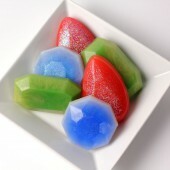 BUt the soap trace become harder not in liquid form tell me the right way..and again thanx 4 reply me. I have been making the same soap recipe for a couple weeks and this is the first time that i’ve found a big crack…. 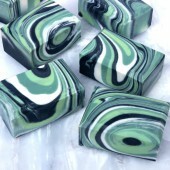 I am making Balsam fir soap nice scent with titanium dioxide swirl. 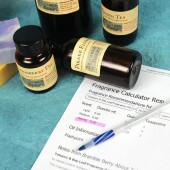 I’m not sure if its the Balsam fir essential oil….. please help… Also i mixed my oils and lye water at 85 degrees. Will covering with plastic slow down the rate of evaporation? My soap began cracking shortly after pouring. I used colloidal oatmeal AND calendula. 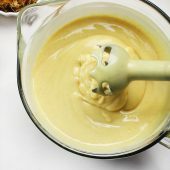 It makes sense to saturate dry ingredients prior to adding. Live and learn. Hope to salvage these very expensive aloe loaves. I made the clover and aloe spin swirl using oxides and micas, and it had split the following morning. Does mica cause this? The split in the soap is where the black oxide meets the bronze mica, but interestingly it’s also split perfectly around a black section too following the swirl perfectly, but maybe there is bronze mica under that black swirl. Is this a possible cause? I followed your recipe but substituted palm oil and caster oil for for 3oz mango butter, 3.3oz cocoa butter and 2.5oz hempseed oil. Wondered if the mica could cause layers to separate and split because I kept butters to a minimum. Hello! I don;t think heat because our house was really cold (ran out of chopped wood 🙂 ) so around 50-55oF and I mixed the oils and lye at around 110oF. It is cracked on top yes, following the swirl perfectly. The largest is between the black oxide and bronze mica and a smaller long crack goes along and around a thin black swirl. I kept butters to a minimum as I know cocoa etc can cause cracking, unless you think the 6.3oz is still risky? As for sodium lactate, maybe I should keep that out too, I measured out about two teaspoons, but I maybe three went in as I grabbed my dodgy measuring spoon! Hoping it’s that simple as the effect is beautiful. I’m trying again without micas in case that’s the issue, but suspicious as one crack is directly running through the black oxide. Also if it helps with diagnostics, the black iron oxide part that cracked is “puffy”, I gently pressed down to try and seal the crack and some of it came away onto my glove from the soap surface like marshmallow fluff, the whole area looks slightly raised compared to the other three colours. 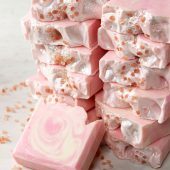 I am wondering if you have ever had soap that was poured in layers crack apart? 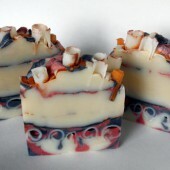 I made a patchouli soap last week, and added coconut milk to half the batch to create a two-tone effect. While the color is better than I had hoped, the two layers are cracking apart. Is there anything I can do to fix it? Almost every bar is separating where the two colors meet. 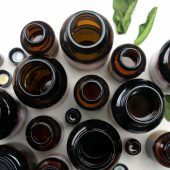 I actually use a palm-free recipe from this site, and I boil down Guinness beer to use in place of water to give it a nice tan color. Normally I put coconut milk in it. This time I divided it in two, and only put the coconut milk in half the batch. I now think it must have decreased the temperature too much. And no, I didn’t spray alcohol between the layers, I just learned that trick the other day. Is there anything I can do to repair my cracking-apart layers without melting it down and starting over? It did come out with two lovely tones, I would hate to lose them. I had the same thing happen. I made a lemon verbena loaf. I sprayed alcohol between the two layers and popped it in the fridge immediately to keep it from gelling. The bottom layer was fine, but the top layer became flaky and separated completely from the bottom layer when I cut the bars. I’m not certain what happened, but I’ve noticed this a couple times now when there is a high amount of hard oils in the recipe or when I refrigerate the loaf. For this particular one, I used illipe butter, mango butter and cocoa butter along with coconut oil, safflower and Sweet Almond oils. 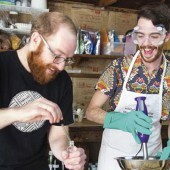 We usually don’t recommend spraying alcohol in between cold process soap. 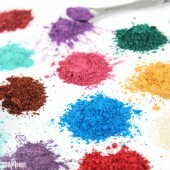 You can spritz a tiny bit to help distribute a mica line, but too much can make the layers separate. I’m sorry about any confusion. 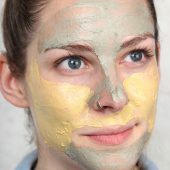 I went ahead and updated the Lemon Poppy Seed Cold Process Tutorial with instructions to lightly blow on the soap, rather than using alcohol. That helps prevent that separation! 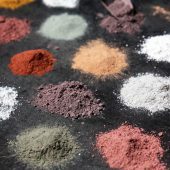 Were you using mica lines in either of the recipes? Also, how much butter did you use in your recipe? Did you have more liquid in one layer? Thanks for answering my questions! Nice article! My soap usually breaks while taking shower. 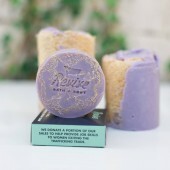 Lowering tthe use of essential oils at the top and avoiding overheating can helps in making soap hard and can’t break. BTW thanx for sharing! Great article as always. I only had one loaf to crack and it also developed what you folks refer to as alien brain. I knew as soon as I uncovered what happened. I added honey to it at trace for the color and I soaped it hot and I insulated it very well so I knew immediately that it got too hot. Fortunately, the crack was in the middle only and was not deep so I was able to trim the alien brain off the top of the cut bars and I used the cracked portion for myself. Lesson learned! 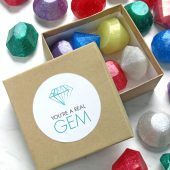 I wish I had known about this site then! I had a batch of soap crack recently. 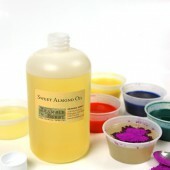 It was a mostly soft oils recipe that I had used before with great results. This batch the only thing I did differently is after 2 days making it, I put it in the freezer so I could unmold (I was impatient and it wasn’t quite ready to come out on it’s own…). I unmolded, no cracks, everything looked great, but by the next day there were huge cracks along the bottom. I think it was from the still-pretty-soft soap warming up after being frozen, but maybe I’m off base? 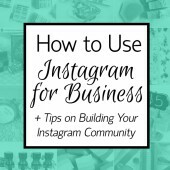 Let me know what you think and thanks for the excellent post!